Launch of the Centre for International Theatre and Performance Research at Royal Holloway University of London. Prof. Helen Gilbert (founder and director of the Centre) kindly asked me, as PhD student in the department, and as Noh practitioner, to take part of the launch and give a little demonstration for the large audience attending the event. My choice fell on the shimai Tamura no kiri, the last dance of the shuramono (ghost warrior Noh) Tamura. After having performed quite a few times for international audiences not necessarily acquainted with Noh theatre, I realised it is rather counterproductive to feed in the expectation of Noh as slow, refined, and boring. The kiri section of a shuramono piece is instead dynamic, energetic, powerful. In this case, the general Tamuramaro recounts how he annihilated a horde of demonic invaders with the help of Kannon’s powers (Kannon is the Japanese name of the Bodhisattva of Mercy Avalokitesvara). After the performance, I received several interesting comments which generally expressed the surprise of many of the spectators in seeing such a dynamic Noh dance. The general expectation is that of stasis and sophistication and not of strong chant and jumps. The excitement of the comments and the numerous questions I received made me reflect on how little of Noh is known outside Japan. Last time I attended a full-day of Noh, with a piece performed for each of the five categories, I was amazed by how plays differ from each other – to the point that I had the illusion of seeing different genres on stage, not only Noh. A few days after this day, I attended a performance by Noh professionals somewhere else – they chose to perform a sophisticated piece of the 3rd (women) group. They literally killed the audience, who were by rights unprepared to enjoy this complex play. 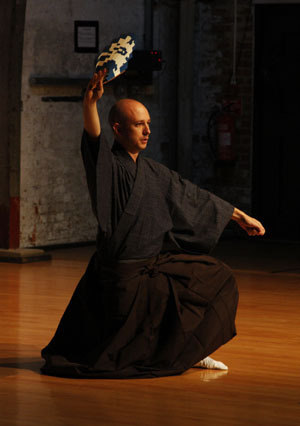 The performance simply confirmed the commonplace of Noh as slow, cryptic, difficult and boring genre. I myself was bored, probably influenced by the communal spirit that sometimes takes over the stalls. Studying Noh theatre requires a little bit of housekeeping before you start. Cleaning means preparing a space for someone or for something to come and getting ready to receive it. As a host prepares to receive a guest, the body and the mind of the trainee (and here we could argue on the distinction made) get rid of layers of dust that have been unconsciously covered floor and furniture and open the windows, letting fresh air come in.